Make these Happy Valentines Cards and express your love for those you hold close to your heart. 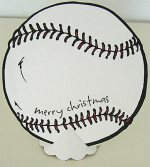 Surely a card made with your own hands is especially precious and will be treasured by the one you love. Below are some valentines cards that I have created. Also included here are some by Valerie Smith another cardcrafter. I hope to add more to this list whenever I have leisure time to create so do visit again to see newer handmade valentines cards. 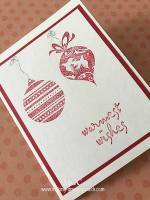 Or you can subscribe to this cardmaking website by clicking on the links provided below so that you'll be able to know whenever new cards are added to this site. valentines day card - a pocket tag card using scrapbooking paper and heart stamps. valentines day cards - two cards with love hearts to make. origami valentines cards - learn to fold an origami heart card from a sheet of paper. chic shoe card - from a pair of shoes comes the idea for this chic shoes card. valentines cards with stickers - layering stickers to make a bouquet of flowers. 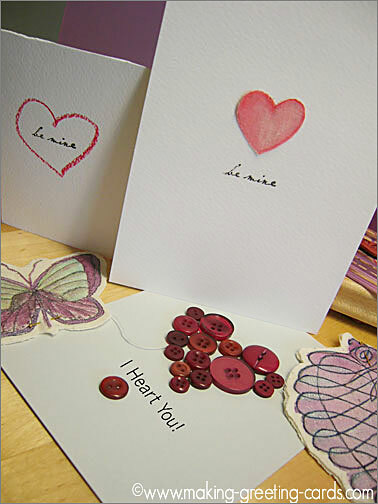 "I Love You" card - say I Love You to that special someone with this handmade card. happy valentine cards by Valerie Smith - lovely ideas for happy valentines cards from another cardcrafter. 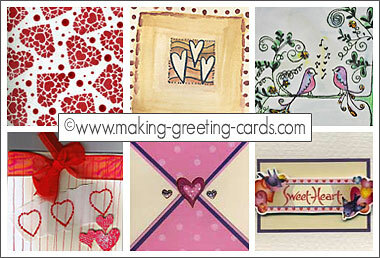 Valentine's Day card Challenge - these are cards created by some online friends for a card challenge. 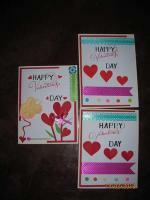 more valentine day cards - some homemade valentine cards by cardcrafters. love birds greeting cards - love birds greeting cards with two lovebirds perched on a branch amongst pink cherry blossoms. charming love birds greeting cards - these love birds are so lovable that I'm sure they are a joy to receive. Add a romantic sentiment to your handmade Happy Valentine's card to express your feeling and thoughts for the loved one whom you are sending the card to. Here are pages of these love quotations you can choose from. Scroll down to add a comment/feedback below if you like this page. Hope to make more of these Happy Valentine's Day cards and add them here. 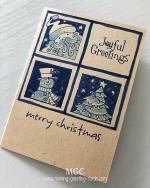 So do check back often or join my Making Greeting Cards Facebook group or Google+ community.